The Yankees and White Sox played on July 5, 2016, at U.S. Cellular Field. The Yanks had Brett Gardner on second base in the top of the ninth with no outs when Ronald Torreyes hit a high chopper toward first base. White Sox pitcher Michael Ynoa ran toward the ball to make a play but the ball got by him. Torreyes, running on the fair side of the runner’s box, bumped into Ynoa as the ball was being fielded by first baseman Jose Abreu, who tagged Torreyes. First base umpire Vic Carapazza called obstruction on Ynoa and Torreyes was awarded first base. Gardner advanced to third on the play. 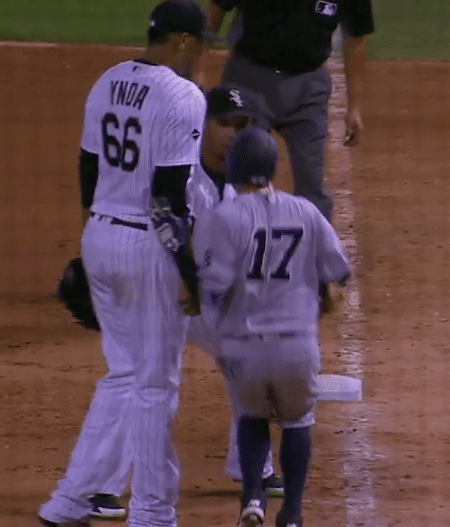 Before the ball got by Ynoa, the White Sox pitcher had the right of way because he was in the act of making a play. At that point it was the responsibility of Torreyes to avoid Ynoa. However, once the ball got by Ynoa, Torreyes had the right of way and Ynoa’s job was to vacate and not hinder or impede the runner because he did not have possession of the ball nor was he in the act of fielding the ball or receiving the throw. Ynoa did not give Torreyes the right of way and was properly called for obstruction. This is a common problem for pitchers because they are not aware of the batter-runner’s rights in that situation. To view this play, click on the link below.